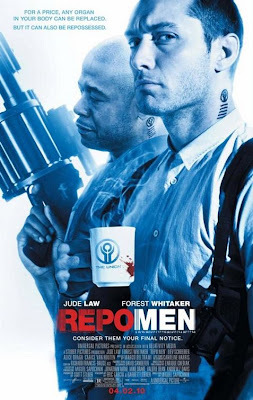 Blu Ray Review - "Repo Men"
In the not so distant future, organ donors are a thing of the past, replaced by mechanical versions of our vital organs. If you have a heart attack, contract cancer, or suffer an accident, a much more durable version of your affected body part can be put in at a high price. But if you fall behind on your payments, Jude Law and Forest Whitaker will show up and cut it out of you. That is, until Law has an accident and wakes up with an artificial heart in his chest and an outrageous debt to pay. When he can't get back into the swing of repossessing (and murdering most of the clients, mind you), he ends up on the run and wages war on the company that provided his heart. The problem with concept films is that the writers and directors of these movies focus entirely on the concept and not on the story or progression of the movie. Obviously this is an easy trap to fall into because it happens all the time. "Daybreakers" from earlier this year is a perfect example of this. "Repo Men" has an interesting idea from which to build a strong movie (and interesting enough to get me to rent this against my better judgment). But in truth this thing never really gets off the ground. The first 15 or 20 minutes does a decent job of setting the stage but everything after that is an utter mess. Weak story development, an over reliance on "shocking" bloody, gory shots, and embarrassingly one dimensional characters plague "Repo Men." A cast that includes Law, Whitaker, and Liev Schreiber should be a selling point but it's incredible how lackluster and uninspiring their characters are. "Repo Men's" final insult is a conclusive plot twist that has very little attachment to the rest of the film and lacks originality or even desirability. It is just a poorly conceived film all around the mercifully ends before too long. Note: No Movie News Today, yet again. I apologize. I just got a new, super awesome laptop and it is wildly different from my old, crotchety, unhip laptop. The transition is taking longer than I had anticipated. Who knew Windows 7 is to Windows 6 what "Star Wars: A New Hope" is to "Star Wars: Phantom Menace." Seriously a crushing defeat at this point but man, is it different. Everything should be back up and running tomorrow, however, so fear not, dear readers (all 6 of you).